Princeton University's Manuscript Division in the Department. of Rare Books and Special Collections (on Twitter) holds the Hudson Review Archives. 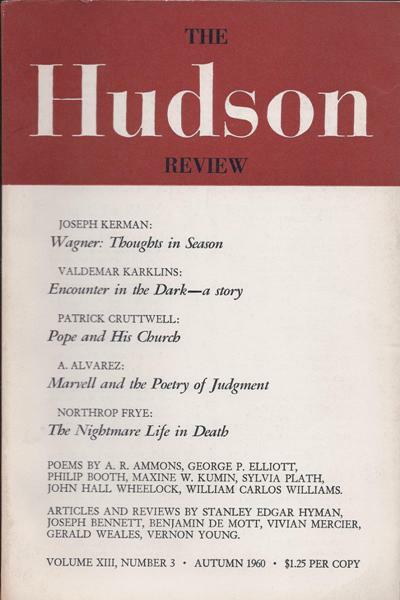 The Hudson Review was founded by Frederick Morgan in 1948. He ran it with his wife, Paula Deitz (Smith College, class of 1959). Sylvia Plath published four poems in their Autumn 1960 issue: "Ouija", "Electra on Azalea Path", "Suicide Off Egg Rock", and "Moonrise". As you might have guessed, there are Sylvia Plath archival materials in the collection, in box 99, folder 9. There are two letters from Sylvia Plath in the collection dated 1 June 1959 and 7 October 1961. The 1 June 1959 letter is typed, on off-white/cream colored paper, and signed in Plath's distinctive bold black Schaeffer fountain pen. Plath writes that she is happy to know that Hudson Review has accepted her four poems, and gives biographical notes about herself as well as a list of 13 journals and magazines in which her work has appeared and 3 that have accepted but not yet printed her work. Plath closes the letter updating her address from 9 Willow Street to 26 Elmwood Road (she and Ted Hughes were a month away from their cross country trip which was followed by their stay at Yaddo). The 7 October 1961 letter is also typed, but on her blue air-letter paper from Court Green. In this letter, Plath asks for copyright assignment for "Moonrise", "Ouija", and "Suicide Off Egg Rock" for their appearance in the Knopf edition of The Colossus, published in May 1962. (You may remember from the previous post, that Plath also sent a similar letter to Poetry on this same day. It is clear what she was doing on this day!) Plath did include "Electra on Azalea Path" in her request as that poem was not one she included in the volume. Plath had rejected the "Electra poem" from her book as of 23 April 1959. An annotation on the letter indicates that copyright assignment was sent to Plath's Knopfian editor Judith B. Jones on 10 October 1961. Sally Robson to Paula Deitz, 4 August 2000, granting permission to reprint request. Often archives provide back-stories and a behind-the-scenes look at book publication and production. We frequently only handle the finished product: the hard copy of the Hudson Review, the first edition of Crossing the Water, or Plath's well-read Collected Poems. But what goes into the finished product is usually hidden from view. Though small, this archive is one such instance where we can peek under the cover to see how things went, as is, for example, the "Houghton Mifflin Company Collection of papers on Bitter Fame, 1954-1991" (finding aid) and the "Edward Butscher Collection of papers on Sylvia Plath, 1918-1976 (Bulk: 1946-1976)" (finding aid) that are held by the Mortimer Rare Book Room at Smith College. The photoduplication services provided by Princeton are fantastic. The image quality is excellent and the staff at the Rare Books and Special Collections library is courteous and represents the cream of the crop. All links accessed 3 October 2013.